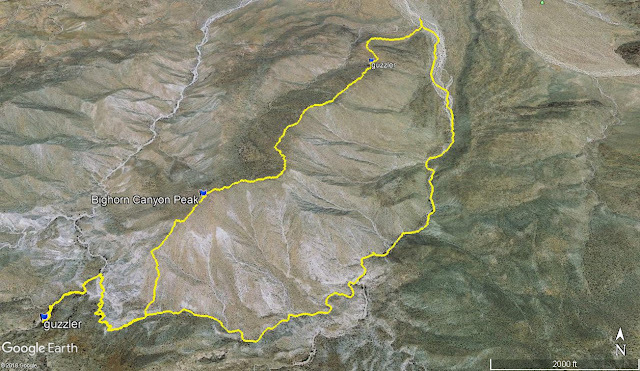 Inspiration for this hike came from Rocko1's report on Bighorn-Nolina and Darren' maps. Thanks! Bighorn Canyon Peak is an unofficial peak (3567') between Bighorn Canyon and Nolina Wash in Anza-Borrego. With prominence of 707', it deserves an official name. I pulled off the dirt road near the start of the ridge and began dodging cactus. At the top of the first bump is a plateau where I was surprised to find a guzzler with several tanks. 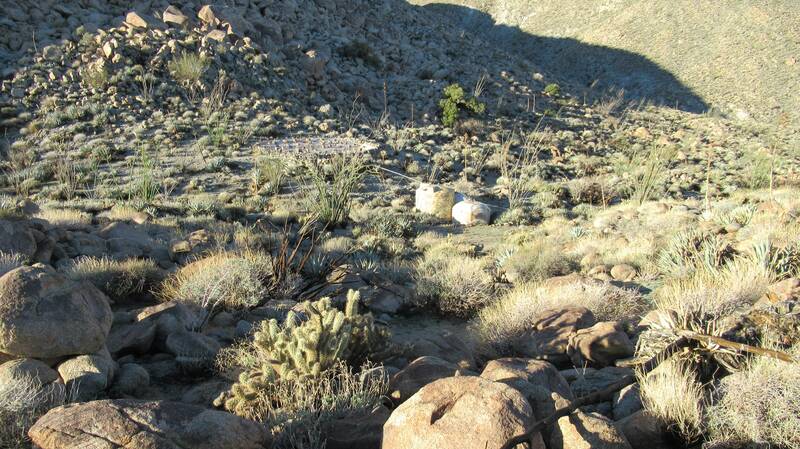 After checking it out, I scrambled up a class 2 slope filled with boulders. Above the boulder slope, I found a radiosonde device. These are NOAA weather balloons. It said "harmless weather device" and a return envelope was attached. The rest of the ridge was gentle, though agave was thick. I didn't want to backtrack too much so I started down the south ridge. I was prepared to climb back out if I cliffed out. It was very steep but was not technical. My blood starting pumping when I reached a cliff about 400' below the summit. However, I was able to drop down a steep gully into Nolina Wash. I think there was also a safe descent path on the other side to Bighorn Canyon. The skull and bone piles described by Rocko1 were all pretty much the same, except the deer carcass had been moved. Super fun hike! I plan to go back for another unofficial peak on the other side of Nolina in a month or so. Sorry I'm too lazy to post all my photos (can be found on my blog). Cool. Looks like you found a NOAA balloon. I’ve never found one. That was my first balloon! I wonder how many they lose out there. I'm going to mail it back on Monday. Monday Maniacs have not been there yet. There was no register or benchmark. There were 4 claimed ascents in peakbagger: John Strauch, Wayne Wilkinson, Richard Carey, and Don Raether. Your radiosonde looks fairly complete, if you are near Rancho Bernardo you can drop it off in person to the NOAA office, that is what I have done a few times in the past and will need to again with the growing collection in my garage. Oh yeah...there are two radiosonde balloons that get launched every day from Kearny Mesa I was told by the NOAA folks. I am in south OC so will mail it. It was in good shape. Two a day!? There must be a lot of them lying in gullys and on seldom visited slopes. Interesting. I was thinking about how those guzzlers were installed. I am guessing they used helicopters to get those tanks into such remote areas. Totally worth it to help out the bighorn population. Pretty sure that is how they did it also....either that or tons of Boy Scouts. The guzzlers at Pinyon have Boy Scout plaques on them IIRC. Very nice report! I did not know there were so many guzzlers in such a close proximity. Were either of the guzzlers full and dumping bleed water out? There was water in the first guzzler on the ridge but none of the tanks were overflowing. At Blue Spring, a stream of water was pouring steadily out of the top of one tank. I wonder where the rest are hiding. I am curious where the tanks you saw first are being filled from? A pipe running all the way to blue seems like it would be very difficult to install. I am guessing it catches run off from the slope directly above it. There was also a wooden post there for a trailcam, but no camera was set up. This one probably doesn't get as much animal traffic as the one at Blue Spring. You are right about the distance, though, Blue is about 3 miles away. Interesting. Thanks for the picture. Update to correct the record. Another party climbed this peak at the end of February and found a register placed by...Monday Maniacs. I honestly didn't look very hard because I didn't expect to find anything. The Maniacs have been on just about every bump in the desert.